For those of you who are unaware, this week is National Farmers Market Week, first recognized by USDA back in 2000. Farmers markets have connected producers straight to consumers for thousands of years, from the banks of the Nile in ancient Egypt to the streets of Paris to the waterfront in Seattle. 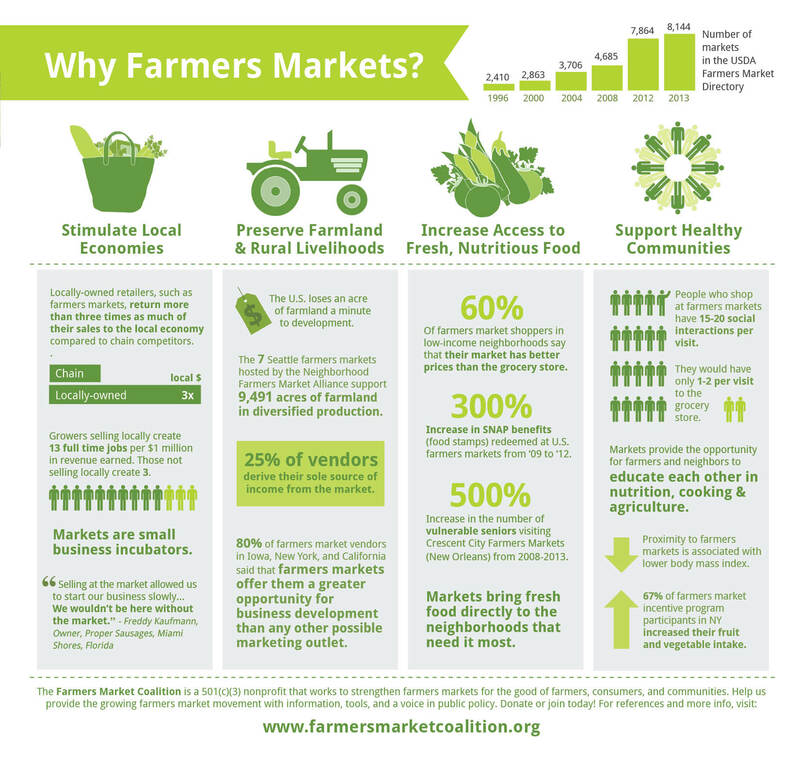 While the concept is rather simple - farmers truck their goods most often to a metropolitan center, where a high volume of city-dwellers can come to buy fresh produce - only in the past few years have farmers markets seen strong increase in demand in the United States. In fact, the first of this variety surfaced only within the past four decades, serving as a counter to the increasingly industrialized and commercialized agriculture sector. In 35 years, the number of farmers in the States has diminished, the proportion of heavily processed and generally unhealthy food-like substances on grocery shelves has grown, and Americans are increasingly distanced from the land. Yet, numbers are telling, and the farmers market county has surpassed 8,000. The farmers market differs in so many ways from modern-day supermarkets that serve the sole purpose of providing a venue at which to buy groceries. As I stood this past Sunday behind our check-clothed tables, filled with the mid-summer harvest, this distinction struck me full force. This weekend marked the third anniversary of my move to Washington, DC, and very nearly the same for working at this particular farmers market stand. Not surprisingly, such milestones often induce a particularly contemplative state of mind, a bit of self-reflection and assessment. Prying into the hovering question of what motivates me every Sunday to roll out of bed at 6:15am, spend the next 7 hours setting up tents and tables, constantly replenishing fruits and veggies, and chatting up customers who stop by. But that's just it. What sets the farmers markets, in spite of their rapid proliferation, apart from their impersonal super counterparts is what ultimately attracts the consumers, the works, and the farmers. It's the fact that I refer to E as 'my farmer' and feel both a sense of responsibility and pride in what he produces and we sell. It's the fact that week after week, month after month, and yes year after year (even in DC! ), the same people come back to buy their weekly scone fix, box of blueberries, or the rhubarb jam they can't find anywhere else. It's the fact that the farmers experiment, trying out varieties that would never grace a supermarket shelf or staying on the cutting edge of innovative methods to combat pests or weather the far-from-normal bouts of rain and drought. Finally, it's the fact that almost everyone I come across at market is there because they feel driven, have a mission, or simply care. Perhaps that's a 20th/21st century phenomenon with markets, stemming from a dissatisfaction with 'big ag' and a passion for simple pleasures; arising out of a different flavor of necessity than a century or more ago. So next time you find yourself wandering amid white tents on a calm weekend morning, ask yourself what drew you there. What is it about a market filled with farmers, bakers, and craftspeople that love what they do, that keeps bringing you back? Enough musings for one morning...go eat some height-of-the-season peaches!